The Villa is sheltered from the wind Mistral (exposure south) and located 3 min from the beaches (by car) and 5 mn from the center and the old port by car. It is located upon the Corniche and overlooks the sea. It is composed of 2 CHARMING BEDROOMS : Bougainville , Zapotille. If the weather is fine, you will enjoy the breakfasts on the large terrace with a panoramic view over the bay of Marseille. 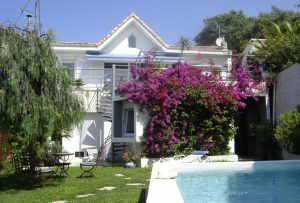 You will enjoy the swimming-pool (heated during the season) and the garden. For the Guests who are in the Room “Bougainville”, a locked place in the garage is offered. You can visit the church Notre Dame de la Garde, or go for a run to the Corniche on the seashore from the House. Some brochures and touristic guides are available too and we can help you any time.